4 JUNE 1983 - STARTUP Through God"s lead, on 4 June 1983 we could rent a shop house in SOKA area, located on Jalan Terusan Bandengan Utara No. 95 C Jakarta Utara. 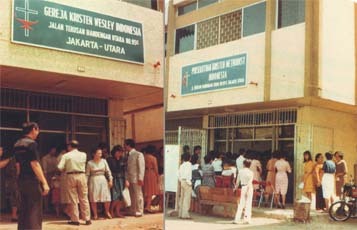 25 AUGUST 1983 Legalized and registered to Indonesian Bimas Kristen DKI Department of Religion Affairs and to Department of Justice. 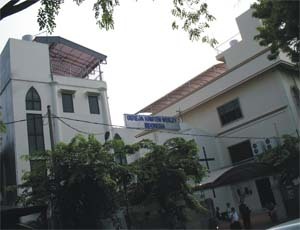 17 APRIL 1984 Church Development Committee was constituted. 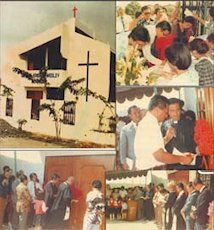 3 JUNE 1984 The new church building was dedicated. Rev. S. A. Manalu STh had the honor to cut the opening ribbon, Rev. Tjong Oen Tek opened the church main door, and Rev. P. Siahaan STh (as Pembimas Kristen DKI) signed up the epigraph. 2003 Our dear God had given Rev. A.O. Angkasa a very important vision. 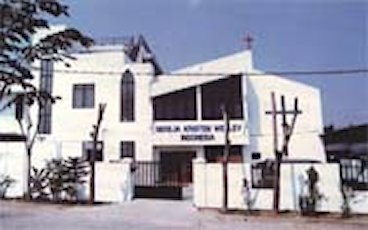 He inaugurated an action called "7 in 1 movement"
2004 "7 in 1 Movement" upgraded to "7 in 1 Action"
OCT 2003 - 2006 The 2nd worship hall renovation project, bible study (training) building, offices, library, and pastor"s residence. 2006 . . . Our MISSION in ACTION . . .
由于看到椰城北區是個廣闊福音的禾場，特別是珊瑚新村區、得祿貢、萬靈岸北與南區及周圍地區。接著此異象，就在一九八三年五月中旬，洪德平牧師及七位弟兄姐妹於陳恩賜弟兄之家開始舉行禱告會。 (Jalan A I No.65A T.Gong Jakarta Utara).